The AL-M1203BS2 is a Filter/Regulator/Oiler unit to be used with the NSK air spindle systems. 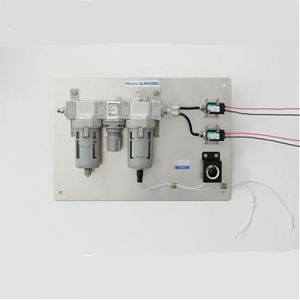 This unit comes equipped with 2 (DC24V) solenoid valves, a large capacity 5 micron filter, a lubricator with high flow regulator. Also integrated is a low oil level warning system which is ideal for CNC machinery. With an additional solenoid, up to 3 air motors can be operated simultaneously. • Solenoid Valve (DV24v): 2pcs. • For use with Ø6mm hose.